Every time I start my 1987 Ford F150 there is an annoying squeal. The duration of the squeal is directly proportional to the amount of cranking time; i.e. when it's cold the engine starts immediately and the squeal will last perhaps 10 seconds but when its hot, sometimes the starter will have to turn it over several times and the squeal will last perhaps 30 seconds. Once I had trouble starting the engine because of contaminated fuel and ran the battery almost dead before I got it started and the squeal then lasted for several minutes. I have checked the alternator belt and believe it to be in good condition and the tensioner also seems to be functioning properly. I believe the alternator has been replaced by a higher amp than OEM. Could the higher amp alternator simply be placing more load on the alternator belt than it is capable of handling? Any suggestions will be appreciated. A couple of things may be happening. First the belt maybe stretched or a little on the long side and the tensioner is running close to the end of its travel. 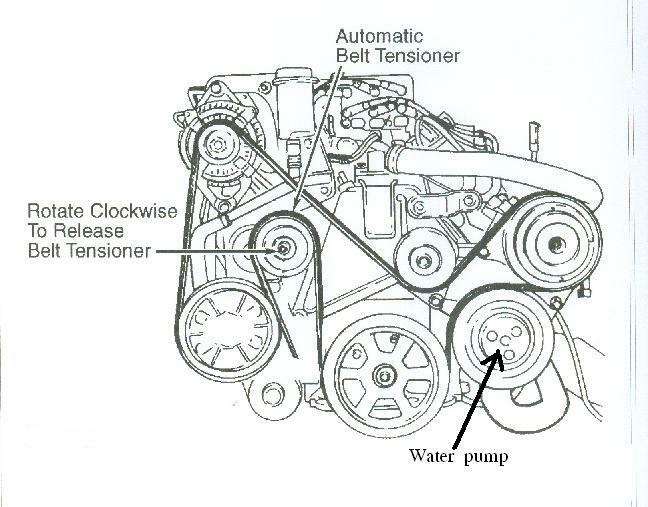 Second the tensioner may have lost its ability to hold the belt as tight as necessary due to the spring being weak. Some tensioners have a pointer and an index showing it operating range if yours doesn’t you can unload the tensioner all the way to the end of its travel. With it there you should only be able to just slide the belt on and off, with every little room to spare. As you stated the alternator has been replaced, the pulley on the replacement may be of a smaller diameter, which would make even the proper cataloged belt now to long. Sorry Tom but this engine has a serpentine belt system here is a page from the catalog. 89013 Idler Pulley, w/o A.C.